Corpsmembers stand at Fort Wadsworth. The National Trust’s HOPE Crew (Hands-On Preservation Experience), in partnership with the National Park Service, The Corps Network, and the Citizens Conservation Corps, spent two summers repairing an Overlook wall at Fort Wadsworth at Gateway National Recreation Area. 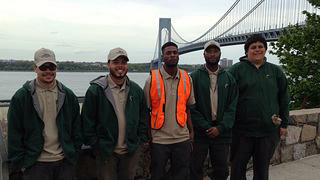 Under the leadership of Ken Follett, the HOPE Crew project taught a team of young participants, recruited at the Citizens Conservation Corps, about preservation philosophy, building technology, stonemasonry, and project management skills, as they worked together to save the site’s 2,000-foot stone wall that provides an unrivaled view of New York Harbor. Although the Overlook wall is constructed of an assortment of natural stones, cut granite blocks, and paving stones, it is 76 years old and must be entirely repointed to be preserved and enjoyed by future generations. Preserving Fort Wadsworth, the fort with the longest continuous military history in the United States, gives visitors a unique opportunity to learn from its story.